For the 6th year in a row, Sounds of Summer Mural will be installed at the SOS festivities site. The Sounds of Summer logo will be the banner across the top of the Mural. Community residents are invited to paint a section of the mural depicting images of SOS activities. Make it an individual or family/group project! Have a painting party and invite friends to be creative! 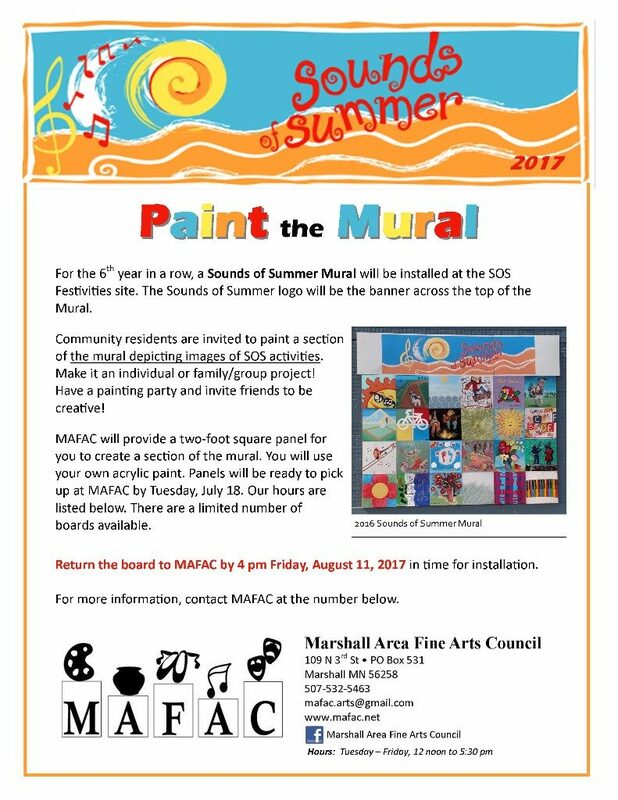 MAFAC will provide a two-foot square panel for you to create a section of the mural. You will use your own acrylic paint. Panels will be ready to pick up at MAFAC by Tuesday, July 18. Hours are: T-F 12-5:30 pm. Return the board to MAFAC by 4 pm Friday, August 11, 2017 in time for installation.